Pachadi : Pachadi is an yoghurt based dish. 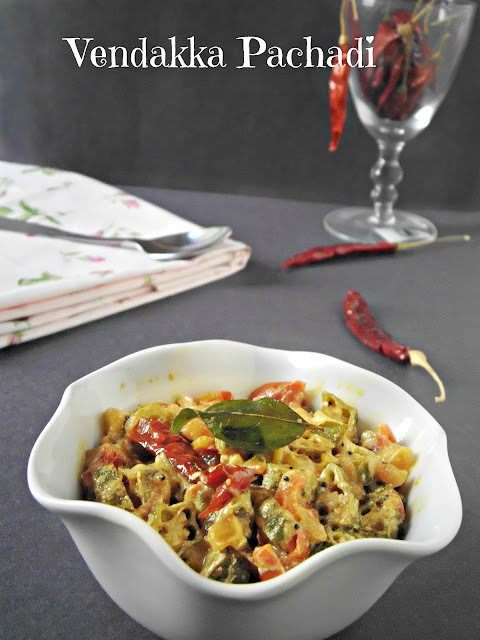 In traditional meals of South India this will be definitely served as an accompaniment along with the other vegetable curries. We can prepare pachadi's with onion, tomato,carrot,beetroot, radish and henceforth you will be seeing them in my space too. 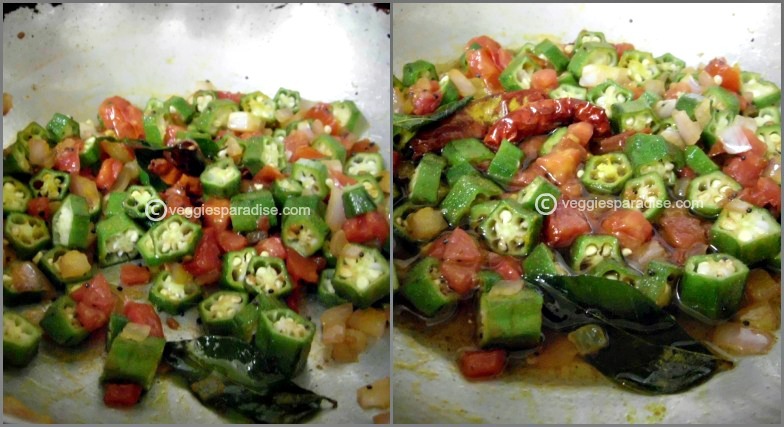 Okra pachadi is a tangy dish as they are cooked in tamarind water and finally combined with yoghurt. Heat oil in a heavy bottomed pan, add the mustard seeds. 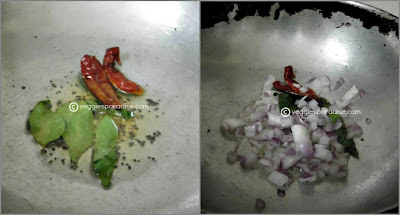 When they pop, add the urad dal, chillies and curry leaves, fry for a minute. Add the onion and fry until soft. 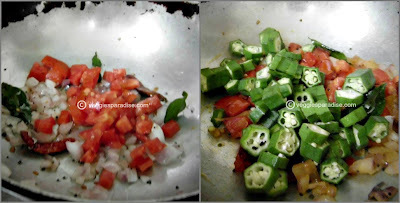 Add tomatoes and okra, fry for a couple of minutes. Add tamarind water , cover and cook until the okra is tender. Season with salt and remove from the heat. Finally add yoghurt and mix it well. Generally pachadi's are prepared in less quantity , and not like the vegetable curries that we prepare for rice. So for the above specifications you will get a small bowl as shown in the picture above. No Spice powder is required for this dish. 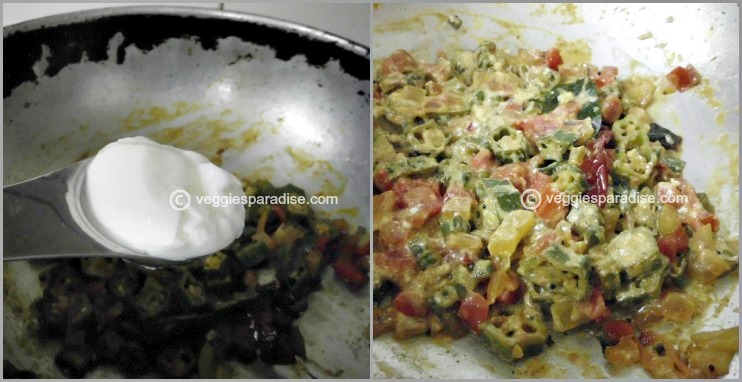 When adding yoghurt , make sure that the curry is not too hot. Delicious vendakka pachadi I love it. I love okra and this recipe looks so good. healthy side dish, love the clicks!!! bindi my fav looks gr8!! 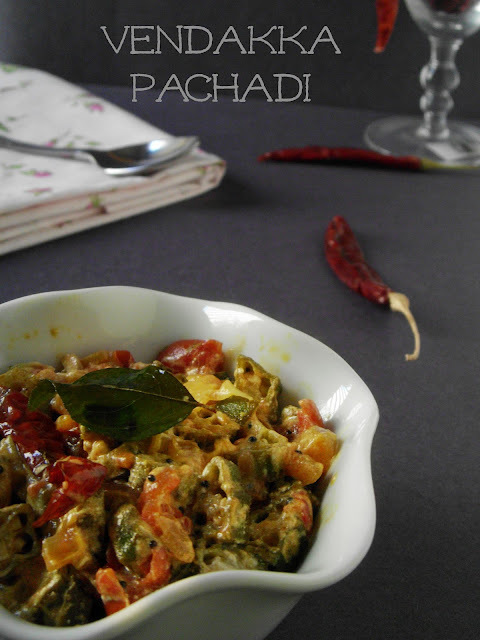 Delicious pachadi, am yet to try this. Hi Aruna, Thank you for dropping by the Runner Girl's Kitchen. Happy to follow you as well! 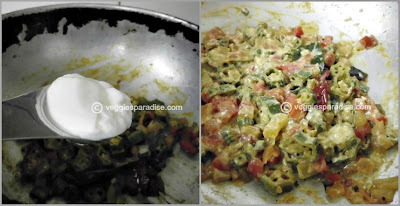 Adding tomato with okra n yogurt is new to me..pachadi looks yummy! Looks awesome, I made similar to this without the tamarind, yet to post..